Open 24 hrs a day. Southern Duckmen are habitat conservationist. We pride ourselves on responsible hunting practices, conservation, education and passing on the tradition to the youth of the south. We see a cold front not as a time to sleep in under the covers on a weekend but an opportunity to get a limit of ducks early at sunrise with our hunting buddies. 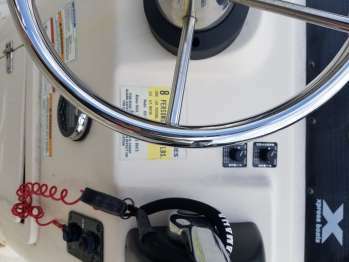 We spend countless hours getting our dogs ready, loading the boat, watching the tides, the weather and brushing the blind for opening morning. We feel a bad day in the blind is better than a good day at work. Work is just something we do so we can hunt. Spots Still Available For NOV.
Teal season was a good one and from the scouting we have been doing in the last week, Opening day is looking real promising. Still have spots available for Nov and Dec. Email Southern Duckmen at southernduckmen@gmail.com. We took 134 for teal and don't plan to stop once we get going again. We usually take wide variety of birds from teal, wood ducks,mallards, greys, pintails,canvasbacks and specks. Went to the lease Saturday and Sunday to clear some grass for our blinds and the ducks were everywhere. Saw lots of teal that the drakes are starting to get their color and lots of big ducks such as greys and some mallards. Had two pairs of woodies land 40 yards away from us as we were riding the 4 wheelers through the spread picking up decoys. This year is looking really promising so far. If anyone is looking to make/swap some hunts this year give me a shout. Also we are doing a youth hunt at the lease this year for the kids. First eight to book will hunt. Went to the lease this morning to put up our new blind we built today and let me tell you what! All fields around us were dry and our pond is still holding plenty of water and the ducks were in there by the thousands. Mostly Teals and Greys and some mallards. The birds didn't want out at all and were landing and flying in with the 4wheelers running as well. My little boy is only two so he cant hunt for youth this coming weekend, but if anyone is interested in taking their son/daughter we can set something up for free for the kids at the least. Great year so far for the 2010-2011 duck season. We are at a total of 484 birds for the season after todays hunt. Alot of teal and greys. We are starting to see more big birds as this front rolls through as well. 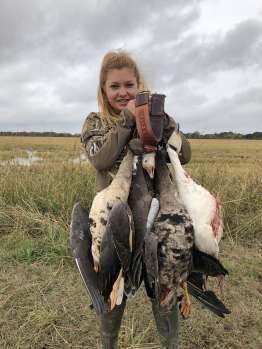 Also we will be starting our goose hunts which are 75.00 a person which we usually shoot specks, with some snows and blues mixed in. If anyone is looking to make some hunts for a reasonable price($100 per hunter) give us a call at 337-501-7660 ask for Joey w/ Southern Duckmen LLC. Even with all the problems field hunters in the area had this season, we still managed to put up some good numbers. Not like what we finished last year, but still respectable. We currently cleared the books and have everyday open as of now for anyone to book a hunt for 2012-13 Season!! We only expect it to get better and better. Here is what we ended up with. We killed a total of 684 birds!! Teal Season was, and is always a sucess. We took 205 bw Teal. Regluar season we took : 38 bw teal,164 gw teal,25 spoonies,17 blackjack,7 ringnecks,3 mergansers,36 widgeon,3 redheads, 13 woodies, 89 greys,18 mallard hens, 24 mallard drakes,10 pintail drakes, 1 pintail hen,3 snows,3 blues, 20 specks, 5 lesser candians. 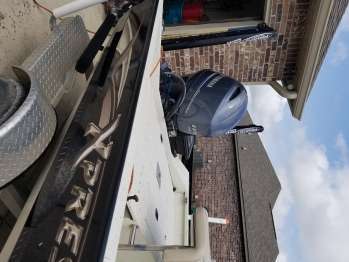 WIN A FREE 2 DAY EXPENSE PAID DUCK HUNT RAFFLE! NOW Booking 2012-13 Duck Season!!! Southern Duckmen Outfitters is NOW BOOKING for Regular Waterfowl Season!!!! ALL DAYS ARE AVAILABLE AS OF 10.10.12!!! Get them while they last!!! Starting at $175 a gun (Drive Up,at least 2 hunters). Other weekend packages available also!! Book you next trip of a lifetime with us at Southern Duckmen Outfitters. Hunts starting at $175 a gun (Drive Up,2 hunter min). Other weekend packages available also!! Went to the lease this morning and let me tell you that we are stacked up with tons of birds. Teal,greys, mallards,and more woodies than you can think of. The 2012-13 season is right around the corner and we still have days available to be booked up. Drive up hunts are welcome as well as hunting packages for the out of towners. Rates run $175 a gun for drive up hunts!!!! 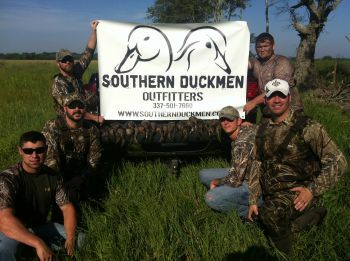 Check out our website www.southernduckmen.com for other special prices! Contact Capt. Joey W. Wiggins @ 337-501-7760 for more information. Went to the property this morning to brush up our new blind and let me say that there were specks and Ducks everywhere. Ill let the pictures do the talking. If you are looking to make some Great, easy access drive up hunts and want to kill some birds.....Book with us at Southern Duckmen Outfitters in SW Louisiana!! 3375017660!! 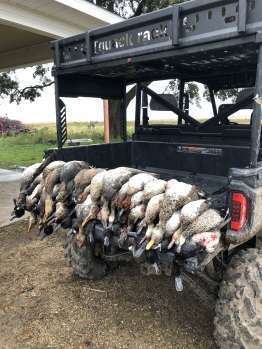 Southern Duckmen Outfitters is now offering guided hunting package deals for the upcoming 2019-20 big duck season! The package deals include overnight stay at the SD Camp and a morning hunt!! Prices are below \r\n\r\n12 person package deal - $2,500\r\n24 person package deal - $4,600\r\n32 person package deal - $6,000\r\n\r\nYou pick the dates and let us take care of the rest! Package deals are based on a 3 or 4 person hunt. Limited packages are AVAILABLE! \r\n\r\nContact us at 337-501-7660 for more info or to lock in these great packages!! 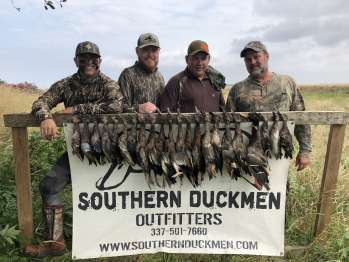 Southern Duckmen Outfitters is now offering guided hunting package deals for the upcoming 2019-20 big duck season! The package deals include overnight stay at the SD Camp and a morning hunt!! Prices are below\r\n\r\n12 person package deal - $2,500\r\n24 person package deal - $4,600\r\n32 person package deal - $6,000\r\n\r\nYou pick the dates and let us take care of the rest! Package deals are based on a 3 or 4 person hunt. Limited packages are AVAILABLE!\r\n\r\nContact us at 337-501-7660 for more info or to lock in these great packages!! 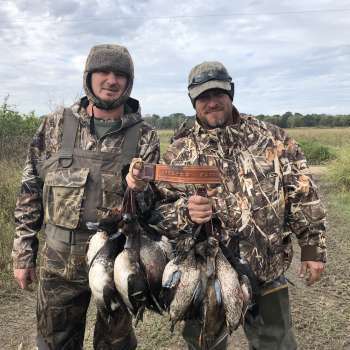 Southern Duckmen Outfitters is now offering guided hunting package deals for the upcoming 2019-20 big duck season! The package deals include, decoys,brushed blinds, overnight stay at the SD Camp and a morning hunt!! 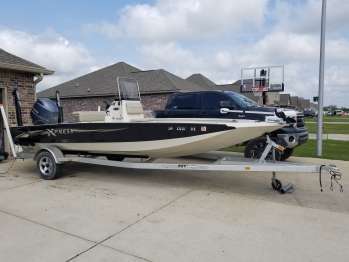 Prices are below\r\n\r\n12 gun package deal - $2,500\r\n24 gun package deal - $4,600\r\n32 gun package deal - $6,000\r\n\r\nYou pick the dates and let us take care of the rest! Package deals are based on a 3 or 4 person hunt. Limited packages are AVAILABLE!\r\n\r\nContact us at 337-501-7660 for more info or to lock in these great packages!! 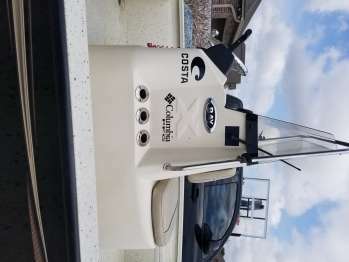 We have some but limited blinds for lease North of Welsh LA in Pine Island area.\r\n2 Blinds available for Duck and Goose Season for 2019-20 Guarantee water and 4 man pit blinds for 5500.00( No Teal Season) or have 5 four man pits for entire season for 6500 a blind. For more information call or text Joey at 337-591-6073. Can schedule a date to show if needed !